Police officers were involved in a scuffle with journalists as Kirumira tried to force the scribes into the police court on Monday. The Inspector General of Police (IGP), Mr John Martins Okoth-Ochola has said the former Buyende DPC Mohammad Kirumira must be disciplined following his conduct at the police court. Appearing before Parliament’s Defence and Internal Affairs Committee on Thursday, Mr Ochola said Mr Kirumira’s conduct before the court contradicts the Force’s code of conduct. “You have all watched the conduct of this officer; his conduct requires us to have him tried in hell perhaps, and you will agree with me that at least we have been giving Kirumira the benefit of doubt,” he said. Mr Kirumira on Tuesday refused to attend the police court hearing after officers guarding the entrance of the court denied journalists access to the court room. “Kirumira takes advantage of being portrayed by the press as a martyr and we shall not accept that,” he added. Since announcing his resignation from police, Mr Kirumira has been vocal against the police leadership, particularly under former IGP Kale Kayihura. He was early this year dragged before the police tribunal and charged with 22 charges of torture, extortion, corruption, bribery, unlawful arrests and excessive use of authority. He has since been acquitted of most of the charges. On Thursday morning, the police court was expected to deliver its ruling over the case. 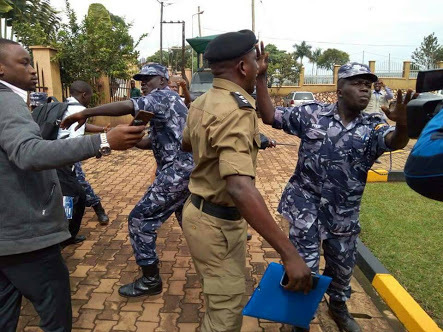 But officers guarding the court were seen battering journalists at Naguru Police Headquarters as they awaited the ruling. The IGP said he doesn’t condone assaulting journalists and advised those who were beaten to seek redress. “An assault is a criminal act; whoever assaults a journalist commits a crime which has to be investigated,” he said.